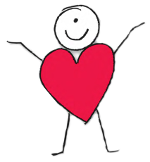 This book (The Heart Book) is the result of a willingness to listen to and follow my heart; to participate in a Great Collaboration of Love; to fulfil an assignment that was meant for me. Like my personal thesis as a student of life, it is a reflection of my spiritual journey, a path with heart. Perhaps something was activated in me from the shock of my surprise party for my fiftieth birthday that prompted me to quit my job and begin an exciting new chapter in my life. It felt has if my own heart had opened, which prompted me to wake up every morning feeling great inspiration and enthusiasm to write. The words flowed easily and effortlessly, like an idea whose time had come. I didn’t know it was going to become a book, as it didn’t come out linearly. All the themes were about the love I was feeling in my heart, and that was what was guiding me. Somewhere in the process of writing, I realized the common thread was about the multi-dimensional nature of the heart, which later became the topic for each chapter. Like the cover of the book, the chapters are like hearts within hearts, delving deeper and deeper into our hearts, until we get to the “heart of the matter”. I visualized the completed collages in my minds eye to illustrate each chapter, months before they were actually manifested. Although I had never made collages before, the images in my mind were so clear and colorful, that I trusted the process that would bring them into being. It was quite a creative process to collect all the individual pieces and put them together to form a whole “peace” of art. The rainbow heart was the center-‘peace’ in each collage, which I hand made from color construction paper for each one. I was dedicated, determined, and focused to see it through, all the while asking for help from Spirit to work through me. My husband David calls it The Heart Book and typeset the manuscript and we had the collages and other illustrations made into digital format. We pursued the traditional publishing options, which were very time consuming and complicated. With the intention to get the message out sooner than later, we decided to self publish, in both print and ebook format. The whole process was a collaboration of love and a lesson in manifestation. 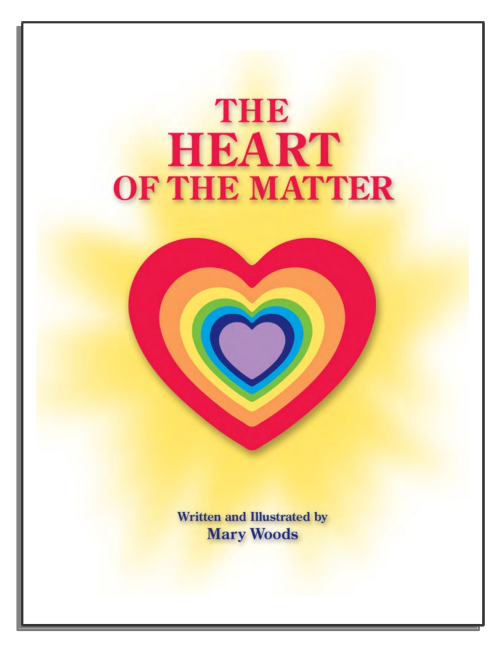 “The Heart of the Matter” is a little book with a big message. It is a simple, but profound message that will hit a chord and resonate in your heart because it rings true. Like a children’s book for adults, it is a fast and easy read, reminding grown ups of the innate wisdom that their inner child never forgot. 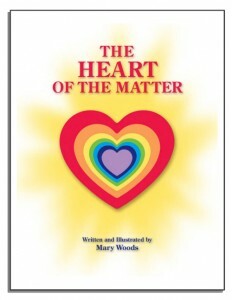 This is a book about the whole heart that guides the reader to an experience of being wholeheartedly happy. It is a spiritual message that transcends different beliefs and divisions, so we can remember the love that unites us all at heart. Highlighted with original poems, as well as quotes from A Course In Miracles to Swami Beyondananda, it is an inspirational and heartfelt look at life that takes us to the very heart of the matter. “It is my hope that my words will serve as a catalyst for an experience of your own inner truth; beyond the differences to the oneness we share as human beings; beyond intellectual analysis to a common understanding felt within our hearts. And teach love upon the earth. True change is in our heart. Of ourselves and those we meet. A joy that is truly complete.